Grand Prix winner Scott Redding will make his much-anticipated move to the Bennetts British Superbike Championship in 2019 after signing for multiple British Championship winning team Be Wiser Ducati. 25-year-old Redding is a four-time Grand Prix winner who has raced in the elite MotoGP class for the past five seasons, claiming two podiums during that time. He is also a twice a winner of the British Grand Prix; once a 125 Aprilia in 2008 at Donington Park, where he still remains the youngest rider to win a GP aged 15 years and 170 days, and again in 2013 at Silverstone aboard a Kalex in the Moto2 World Championship, where the Gloucestershire rider was denied the title due to injury. Redding teams up with Paul Bird Motorsport (PBM) once again, the pair resurrecting a partnership which saw team boss ‘Birdy’ back Redding in various junior championships at the start of his career which started in mini motos in 2001. Redding will have the very latest, brand-new, factory-backed Ducati V4 at his disposal with full support from Ducati Corse for whom he has raced previously. Redding said: “It’s fantastic to be coming to BSB, it’s a championship I’ve never raced in and learning the circuits is very much part of the challenge which I’m looking forward to. This is very exciting for me with a very competitive bike and the most successful team and I’m here to show what I can do. How does a safety car lap with a BSB rider sound? 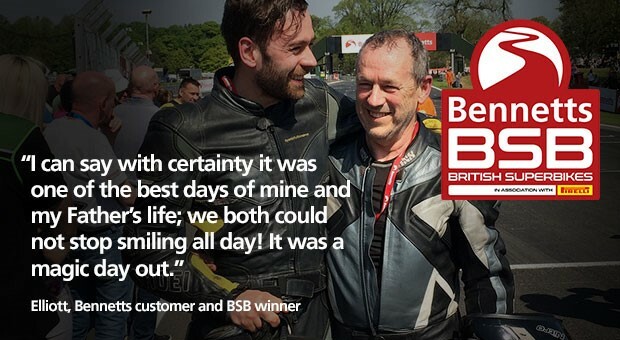 35 lucky Bennetts customers experienced just that earlier in the year at Cadwell Park.